I have a number of little things to get done for Huzzah, some broken figures to replace, some leftovers from the re-org that just need a few officers and a new coat colour to make up a new unit that looks different, trees to be based so they won't fall over and flocked so they won't be quite so embarrassed. So is that what I've been doing on this long weekend? HALT! Advance one and be recognized! I already have enough Oberhilse infantry and artillery in spiked helmets to do Sawmill village. Just have to find/make some tall narrow buildings to use with 40mm troops on a 3" grid. I wonder what part of Atlantica this clash will come. Adobe houses up north or stone & clapboard in the south? But soft! What light from yonder tunnel shines? These last few years seem to have been years of greater turmoil, questioning, understanding and slowly, acceptance, about my hobby than any that went before. At the heart of it are two questions; "What compromises am I prepared to make to make my wargame more enjoyable as a game?" and "How can I make a game with largish figures on a small surface feel like a bigger game yet not too crowded for maneuver?". 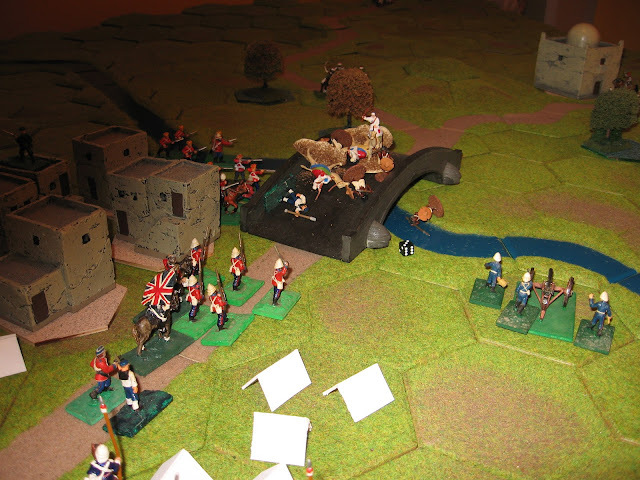 As long as I was fiddling with MacDuff and my 1812 organization again, I decided to address a few ideas that cropped up this fall while thinking about and playing my card table game and Battle Cry. Unit size. I'm not sure when I became bothered by small units (peleton envy?) Featherstone's 20+2 has always seemed comfortable, Lawford & Young's 60 man units always seemed extreme but the 16+3 companies seemed reasonable. 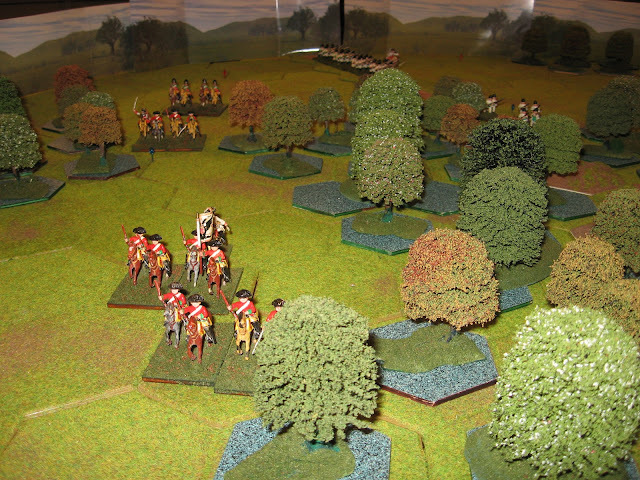 My first brush with 12-14 figure units came with WRG's 1685-1845 rules in the late '70's. These were a bit of a shock, especially since they deployed 1 rank deep but the rules suited me well apart from the movement which was too slow and eventually I managed 24 battalions of 12 men each for each side of my 15mm French Revolution armies. 12 x 24 man units always seemed out of reach and 6 x 48 men unthinkable although its the same number of figures. Perhaps its that I was able to tackle so many different uniforms or that each 12 man batch could take the table when done rather than having to wait for friends? At any event, when I left 15's behind, my units got larger which was counter productive in terms of cost and ability to maneuver on the same square footage, and the ranges got longer since the figures were taller (? ), OK because the unit frontages grew actually. The games seemed to shrink correspondingly but by then in addition to glossies, I was on the net and despite resisting such things could feel the pressure to build bigger battalions. I even managed a few 32 man ones before sliding back to the 20ish ones and slowly down to 16. Range and scale. 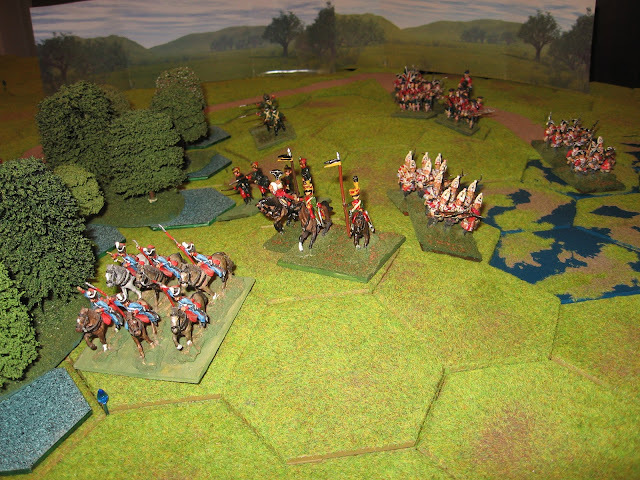 One of the issues with unit size is that unit frontage is irretrievably linked to musket range (thank you for that Mr Grant!). I can get as gamey (sic) as I like but this issue tends to gnaw at me if I ignore it too much. 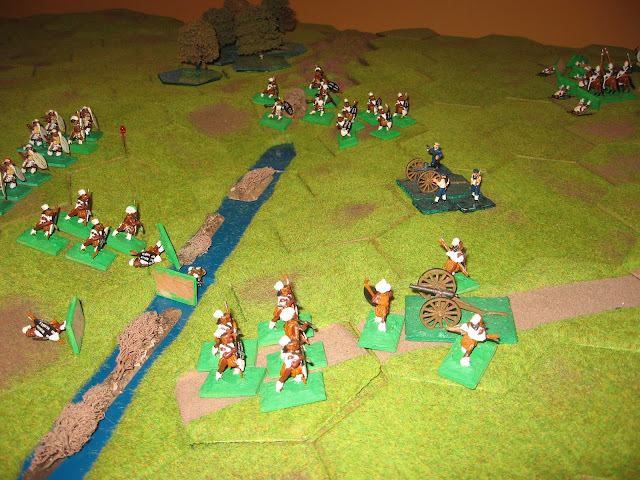 So, 24 x 40mm figures on the washers I use have a frontage in battle of roughly 12" which becomes effective musket range. This was the whole drive behind the basing issues, more men per foot of table so that I could reduce the ground scale and ranges without cutting unit size. So, after the card table and Battlecry games, I've been thinking if I were to allow myself to use 12 man battalions again, (MacDuff originally called for 12 man "companies" - Wings or Grand Divisions really) then while I won't have anything approaching respectable battalions from a spectacle point of view, everything else falls into place. That size unit will let me fill historical 1812 orders of battle and still fit the armies on my shelves and into my painting/collecting mode. More importantly, it would also allow me to cut back weapon ranges making the moves more realistic given ground and desired time scales. This will let me fit historical battles like Crysler's Farm on my table at face value while fudging the smaller actions by using more figures than needed when its "just a game". Stop Action and Ranges. Turning a continuous interactive event like a battle into "turns" has always been a bug bear when trying to recreate the actual processes of battle. The crux of the matter is that somethings are interactive in a short space of time while others are not. This is the basis of the 2 minute move which dates back to von Reiswitz at least. The problem is that with 2 minute turns even a small battle should last 120 or so turns. Even if some one can figure out which of those can be run together, its likely to be a length exercise rather than a brisk game. Generally, the two solutions have been to fudge things to show the actions in compressed form and ignore the inactive parts, usually robbing movement to allow for more nuanced combat or to assume that interaction is taking place largely below the grain and that it is primarily the results that are being shown. I largely went the first route for decades until I read Joe Morschauser and started trying to figure where he was coming from. The point of this is that long and short range has been a bug bear of mine for years now. It makes sense, we all know fire is more effective at close range but when you combine stop/go moves with fixed range bands, well, it seems to twist players' tactics in odd ways. I've tried getting simpler or more convoluted but I think Morschauser was right, shooting is shooting and melee is melee, and after all its worked in Hearts of Tin. Out of curiosity I decided to peek at von Reiswitz again and noted that he has 4 range bands. The first two equate to my short and long range and there is little difference between them. The 3rd and 4th are beyond what I bother rolling dice for and are markedly less effective. The 4th game hangs in the balance. So finally, to the point, as well as smaller units, MacDuff has finally succumbed to temptation and dropped range bands and shortened ranges making the ground scale something like 1"=25 yards and 1 figure = 30 men though you can still rationalize halving that. As long as I was fiddling, I scratched an irritating itch which has no logical basis. The game was always in multiples of 3" until I printed a 4" hex grid on my table and played around with that. It doesn't look likely to survive so I adjusted movement and ranges back to multiples of 3", scaling back ranges slightly while doing so in keeping with the revised ground scale. I'm 1/2 way through a 4th play test with revised layout, rules and OB and so far its the best one yet and I'd be comfortable hauling it off to Huzzah as is, except for those trees. One month to go! The current version of MacDuff is available at left but Blogger won't let me update the description and won't tell me why not, or click here to see and/or download it. I've now done three run throughs of the Relief of Fort MacDuff scenario.The first one didn't make it all the way into the first turn. Last fall in a fit of state thought control I tried to impose a uniform command & control mechanism on my games. The MacDuff + orders dice worked well enough for one solo game and I was quite happy with it. I laid this game out thinking about the convention and 6 players and how to break up the commands to give every one enough to keep them engaged but keeping the game rolling at a good pace to a definite conclusion with a tight window with players who are learning the rules. If this was a 2 player game it would have been ok but to make a good 6 player game using d6 order dice, I would have had to double the planned number of units and allow each player to roll his own die. I have the troops but that many would make for an inappropriately crowded table top, unless I ended up on one of the larger tables. As it is there will be scant room for maneuver. The cards worked as well as they always have and the uncertainty felt right for this sort of confused backwoods warfare. If anything, I was worried about too much predictability, and was tempted to bring back variable moves but I resisted and it worked. The variable order added the right amounts of tension and opportunities lost, exploited or wasted and about the right number of detached units declined to move when ordered. The only sore spot was that with so many small units, there were too few dice rolling for average results and it was all a bit jerky, too many hits or too few. It also seemed too hard to get rid of units since they usually broke needing only 1 successful rally roll to stop running. I've had a love/hate thing for the double hit on a 6 rule. It works quite well for big units allowing similar results without using several of handfuls of dice but for small units of skirmishers they are often rolling 1 die with 6's being all that matter. I decided to try it again using 1 die for 2 figures and no double hits. This gives the same minimum/maximum number of hits but changes the spread especially for small units. To keep the over all average closer, I dropped the to hit number to 5 or 6 then at the last minute wavered and left the 4 in. I also decided to drop all units to 8 figures and make more use of the brigade formation rule. Something I had been considering (and rejected) as an option for my own armies. This is the game shown above, a complete disaster for the Americans. Mechanics-wise, the 8 man units were too fragile and the multi-unit formations too confusing. Near the end of the game I reverted to the 5,6 to hit and that seemed better. I preferred the feel of the 12 man units in the previous game even though its neither company nor battalion and only works from a practical POV. Sometimes though, that should be enough. So, back to the 12 man line, 6 man light units for game 4. I also shifted the terrain slightly to make better use of the table and am going to adjust the force balance slightly in favour of the US. 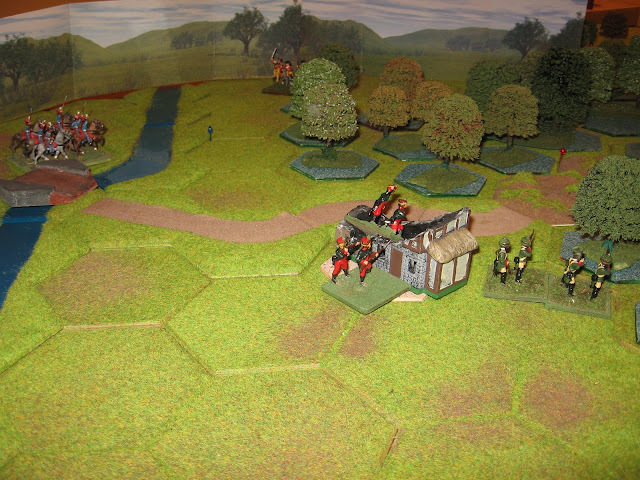 The plan for this weekend was to test the Macduff scenario I'm taking to Huzzah. Its all set up on the upstairs table but for 2 days an abscessed tooth had me huddled on the couch unable to concentrate on much of anything. (I see Bluebear Jeff also has a toothache, I wonder if you can get these things over the internet....) Anyway, yesterday I discovered Hot Teabags as Poultices and they worked marvels to reduce the swelling and hence the pain. This left me today, stuffed full of pain killers but functioning, more or less, just not really up to wandering around the table by myself. Instead I decided to sit with my friends downstairs and play a Square Brigadier game that I had pulled troops for a few weeks ago. This is where I started to get myself into trouble. I've been increasingly aware that I seem to be mostly painting and playing everything except what is supposed to be my main thing, my 40mm Toy Soldiers. I've also noted that I enjoy converting and painting a variety of uniforms but I enjoy it more when there are only a few of each type. This meshes well with playing card table games and with reducing the size of my collection but it clashes with my long held expectations of 20+ man units on the big table I don't have anymore. To fit a game with some depth onto my medium table, I've actually been playing with the idea of a 1/2 scale game, smaller units and shorter movement and ranges. At the same time, since I've enjoyed Ron's Battlecry games with 4 man 25mm units I questioned whether or not I could use my Toy Soldiers for card table games. The short answer is "yes" I can but the feel of the current rules isn't quite right. I've already been questioning the current good/disordered/dead system even though it works and again it is a question of feel not result but the with the singly based toy soldiers, I really felt the urge to give the individuals a role. Oddly enough the whole "toy soldier game" vs "conventional wargame" thing has also been stuck in my brain for a while without any useful ideas to try out. Might have been the pain killers or the square grid but something clicked and in a few minutes I had a first draft and a better (as in more fun) game. So I polished a bit and tried again. Technically this would probably work just as well using elements with an arbitrary strength point value and markers so it might end up as a new version of Square Brigadier but I need to play with it more before I do anything rash. Some of my Italian Greyhound friends, (siblings Zoe, Si and Lila) hanging out while Dad plays. Apparently 40mm metal figures are less tempting as chew toys than 1/72 plastic ones. Here's the final quick draft. Toss for initiative each turn. Winner chooses to move first or second. Ties repeat. 1st player moves or shoots or rallies any and all of his units. If not within 6 squares of general roll to move: 1,2, no move 3-6 obey orders. Make melee rolls for all units on both sides. Defensive fire first o/w simultaneous. +1 in column on road but no attack or shooting or defensive fire. Inf in square move 1. Artillery may not enter woods or town except on road. Cavalry, Infantry and Militia may only move 1 square into or out of woods. Lose 1 square to cross stream. Turns are free when moving.or rallying. Passage of lines: to move through a friendly unit, the moving unit must begin adjacent and must stop adjacent to the other unit. Attack is a move adjacent to enemy (8 squares) Enemy must be in front before attack. If in front of enemy must attack front. Must stop when moving adjacent and may not move from adjacent to adjacent. Shooting: Target must be in front and not adjacent. Fortified 1/4 casualties, round down. Small Arms. 1 die/ 2 infantry, 1 die per skirmisher, Musket Range 3 2 /hit on 6, Rifle Range 4 hit on 5+, Artillery 2 dice per gun hit on 4+. Smoothbore: Range 8 +1 die at range 4. Rifled: Range 12. General may try to cancel 1 hit 1=General hit, 4,5,6 = cancel 1 hit. Melee: If adjacent to enemy. 1 die/figure, 2/gun if enemy is to their front. All troops hit on 4,5,6. Artillery and Infantry with firearms may roll first and apply hits on the first round only if attacked. All other melee rolls are simultaneous. The player being attacked rolls first and casualties are removed then the attacker rolls. Elite + 1 die per unit. Cavalry or in cover suffer 1/2 casualties, sq vs cavalry or in fortification suffer 1/4 casualties. General must roll. 1=General hit, 4,5,6 = 1 hit inflicted. Rally. If at least 1 figure left Roll 1 die 4,5,6 recovers 1 figure. +1 Elite or joined by general, -1 Militia/irregular. Well, here it is. Darker than I intended but this is the point at which I gave up trying to make the fort look like either my firewood pile or some of the pictures of stockades that I've found on the web. Tricky thing wood. The chopped bits of course start out looking like 2x4 lumber but eventually turn bit by bit to a sliver/grey/black colour depending on degrees of moisture, wind action, type of tree etc etc. I've seen 6 month old wood silver grey and year old wood still tan and of course while the War of 1812 Fort MacDuff is probably a recent build, the one in North Atlantica is probably older. Bark of course, is liking trying to paint tweed. Anyway its recognizable that I meant it to look like logs which is the main point. Now, to get back to work on putting more trees into the forest to be seen, and possibly thickening up the abatis, which should I think be a bit closer to the fort, I think some parts of it are barely within musket range at the closest point making it far to easy to negotiate. Trees and brush are going to be a problem as always in a forest fight. Thick enough to look right is a pain for trying to play a game. I do need to fix a bunch of the woodland scenic trees which either have broken bases or have lost foliage but I think more lichen bushes are called for. They give the impression of foliage but can be booted about to make room and don't catch on sleeves or interfere so much with moving figures. Here we have the final layout The over all dimensions are about right ground scale wise for a large fort while the layout is not too far out for a small one and it doesn't look too wonky with the 40mm toy soldiers. Actually I think it has a certain toy soldier playset look to it which is a bonus. There's even a cabin for the officers and the gate still works. The firing step should be an earthen embankment but I had the walkways in hand so figured I might as well save time and trouble and use them. In place of a 2nd blackhouse/bastion I've made a battery position on top of the cabin. Here's the original with 54mm figures for comparison. The new bastion/blockhouse is the only part still the original stockade height. I'm not over confident about the sticking power of white glue on foam so I've used bamboo skewers to hold the various bits and pieces in addition to the glue. The temptation was strong to fix the whole thing to a base but apart from the awkwardness for storing, I will want to use the fort on various table tops and a base would fit some and not others. I also want to be able to use part of the fort on a table edge/corner and/or be able to replace the bastion by a blockhouse. Here we have the 3 sections. Once the glue has set overnight I'll start painting. Meantime , here is an example of a fort with bastion instead of blockhouse. If I can find which fort this is and thus where I got the picture from, I'll add credits. Thank you to Annonymous for letting me know that this is Fort Joseph in Michigan a French furtrading post .The illustration can be found at http://www.wmich.edu/fortstjoseph/about/history.html I must have looked at 50 fort sites on line this winter as well as checking books and I was sure it was a western one but hadn't labelled the picture and was having trouble finding it again. My old grenadiers, shiny and red at last! I've finally finished refitting my old 30mm British grenadiers. At last they are sporting red coats and "real" grenadier caps and I have to say that they look better as glossy toy soldiers than they ever did as military miniatures. That's the last battalion of the old guys. There are 4 left overs that I could convert to a company of light infantry if I wanted to do the work of cutting down the coats and caps but I'll leave them for now, I've been eyeing a selection Willie and Scruby SYW & AR rangers, light infantry and Indians. In the meantime, I'm over due to get back to work on Fort MacDuff for Huzzah! Its a good thing that I'm getting farther and farther into Toy Soldier mode. Trying to turn this old Barzso 54mm Davy Crocket fort into a usable prop for a 40mm 1812 game is even more trouble than I expected which is rare. In many ways it would of course have been easier to start from scratch but I am determined to make some use of it even if it is glue resistant. I did have a reasonably easy conversion laid out until I realized just how much real estate the finished thing would occupy. OK for the main event but this is a game about Indians in the woods more so than the fort so I need to keep the foot print as small as practical. Forts are one thing that really test the imagination of 40mm gamers. Many of these frontier forts were tiny, given the ground scale I need to employ, the square bastion is not an reasonable size for a fort like Stevenson all by itself. but looks nothing like a stockade. I don't have the dimensions for Fort Meigs but it was unusually large, something like 9 acres and on the plans is long and narrow not square. A few calculations show that something like 6" x 15" or perhaps 8" x 12" would be not unreasonable for a foot print. That would have to include several blockhouses and batteries as well as log curtain walls, quarters and a ditch. OK for use with 10mm figures but its not going to work for 40's. Doing Marx Fort Apache style blockhouses that perch on a corner of the stockade was a tempting thought but at the end of the day it looks like I'll have to make do with one vertical log blockhouse/bastion. Remnants of the Barzso wilderness refuge, practical meets proportion. The bastion itself is a problem. The standard sort of square, roofed, horizontal log cabin construction blockhouse was used by both sides but the British usually put them inside the walls while the Americans used them for corner bastions and gatehouses. 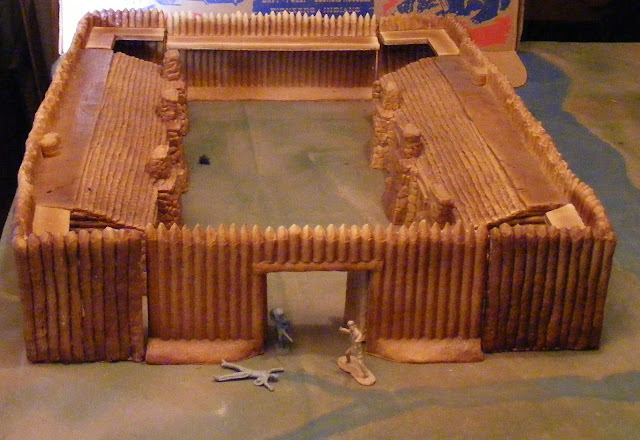 The British used open palisaded corner bastions which is basically what the Barzso fort had although the angles are wrong. I looked at building a proper blockhouse and may do so yet but since the darned thing should only about 1" square from a ground scale angle while being big enough to fold a 40mm gun and crew plus infantry, its going to take some compromises which I haven't worked out yet. The roof also tend to make it awkward to handle the toy soldier garrison. At least my unlikely compromise is a formidable fortification holding 2 guns and a dozen toy soldiers with all around defence should the perimeter of the fort be breached..
Then there is the ditch. This seems to have been major obstacle in several cases, deep and fraised or combined with an abatis. The abatis might work but the combination of ditch and toy soldier stockade just looks wrong and would just distort the ground scale even more. I think I won't waste any more time on ditch ideas, it can be assumed and built into any assault rules. So there we are, I'm only using barely 1/2 of the original fort though I've destroyed it thoroughly in the process of experimenting. The result should be small enough to not dominate the table and give the impression of a stockade while holding 6 x 8 man companies of 40mm troops. Hope for their sake that it doesn't rain, there doesn't appear to be room for tents let alone barracks! In a comment to the last post, Mr. Kinch requested some intel about the Colonial games Ron & I have played using BattleCry. Wherever something isn't specified, the original rules, or such other rules as the players agree upon, will apply. We have experimented with various ideas but what follows is the final choices we agreed upon for the types of units that we have available to field. The intent was to put Grant Scenarios/Tabletop Teasers on the table so that translation will be part of this post. 2. Embolden means that a unit may ignore a flag (retreat) in addition to any other terrain, leadership etc effects. 3. Get out of trouble quick. Units that may retreat more than 1 hex on a flag, do not need to do so and are only penalized if they are unable to retreat at least 1 hex. The idea was to allow skirmishers and non-melee troops like Afghan Jezzailachi (sp?) and irregular cavalry to fade away quickly. 4. Shooting. The Battle dice numbers are read left to right starting at range 1 so Imperial infantry roll 4 dice at range 1, 3 at range 2, 2 at range 3 and 1 at range 4 while native snipers roll 2 dice at range 4,3,2 or 1. 5. After Combat Moves. Units that may "Take Ground" which initiate a melee attack (adjacent) and destroy their opponent or force them to retreat may occupy the hex the enemy was in. If they are allowed to Overrun they may also conduct a melee attack after taking ground. 6. Zone of Control. This is our one rule change and is one we have carried over. A unit which moves adjacent to an enemy unit must stop. A unit that begins adjacent to an enemy may not move to another adjacent hex during normal movement. This does not affect taking ground. 7. Game Length and Victory Conditions. We generally play until the card deck is exhausted or one side reaches it break point. Since our time is not unlimited, we tend to ignore the "reshuffle the deck" event that is on at least 1 card but that is purely for convenience. If the deck runs out before either side is broken, the scenario victory conditions apply. Since the armies are often asymmetrical in numbers of units, extremely so in the case of Zulus, instead of basing the break point on the size of each army, we make the break point of both sides equal to 1/2 of the larger side. In the case of Brits vs Zulus this means the Brits are often able to fight to the last man or nearly so. 8. On the Move. If a player is unable to play any of the cards in his hand, he may move one unit in any sector but may not battle. If the discarded card is a scout card then the player may scout (ie draw 2 cards and choose one). 9. Hills. I almost forgot hills! Hills in Battlecry are 1 hex things. 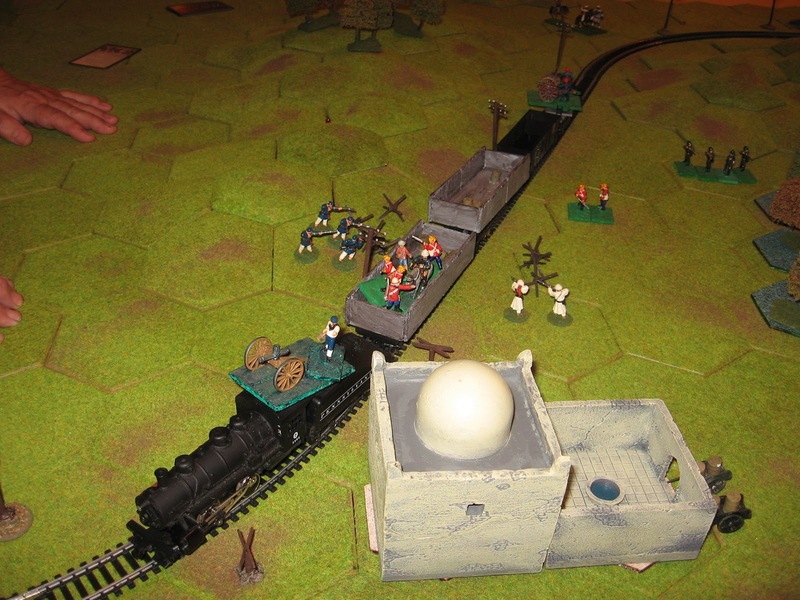 Hills in the scenarios and on Ron's table can run for a dozen hexes and be of several layers. This has provided us with some of the thorniest conversion problems. I think our current ruling is that Hexon slopes affect line of site but do not count as Battlecry hills, only hill top hexes count. Hill tops ignore lower contours or slopes for LOS and vice versa but otherwise, you can see into but not through another slope or hilltop hex. The Holy Sheikh El Airfix has led many a warrior to Paradise while remaining to guide more. 1. Imperials. The Imperial troops are a pretty straight forward translation of unit to unit. We did look at different grades of Imperial troops but since the only non-British units Ron has at this point are Sikhs, Gurkhas and Bengal Lancers, we dropped it. We also looked at special movement or terrain rules for Gurkhas and Rifles as light infantry but it ended up being more trouble than it was worth with little justification. We classified Gatlings, Gardiner Guns and Mountain Guns as Light Artillery. So that leaves us as: 1 infantry unit per scenario infantry or light infantry unit, 1 cavalry unit per light, medium or heavy cavalry unit. 1 gun of the player's choice per battery. If the troops are available and appropriate, Irregular cavalry such as Frontier Light Horse may be substituted for Light Cavalry and Native firearm troops for Light Infantry. 3. Afghans. All scenario units are 1 for 1. Cavalry units become Native cavalry, light infantry become Native Infantry with Firearms, Artillery becomes Native Artillery and Infantry are usually Native Infantry with Mixed Weapons. A proportion can however be made Ghazis and as such are fielded as Elite Native Infantry with Melee Weapons. The Mixed weapons units seem to be about the weakest units on the board and we considered allowing extra or changing them but since the Afghans have been winning more games than they lose (even if one was won by a sniper card and a crossed saber roll on the 2nd to last card in the deck). 4. Mahdists. The Mahdist forces are similar to the Afghans except that we do not field any mixed units, instead each scenario Infantry unit becomes two Native Melee Infantry units. The Hadendowah are rated Elite. 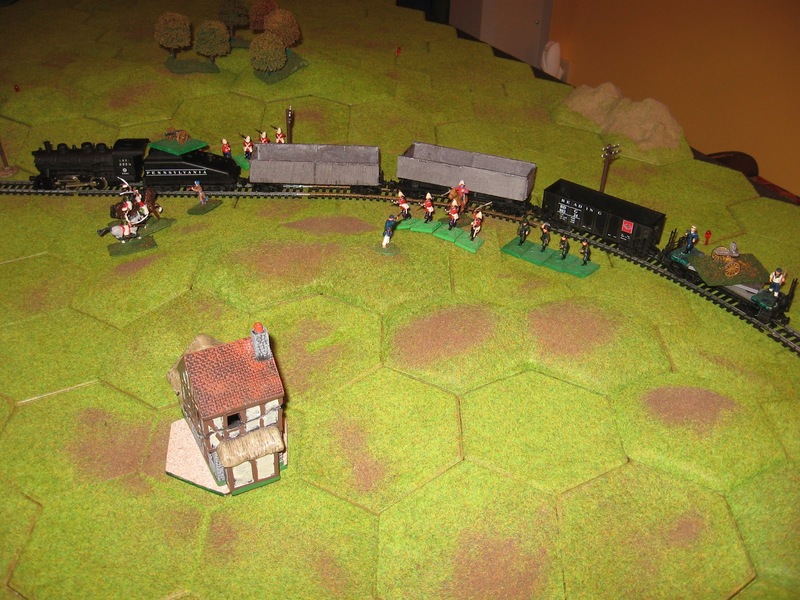 The scenarios often produce situations not covered in the rules, for example, blocking train tracks not to mention, moving a train. Be prepared to improvise! OK maybe not that guilty, its not like I've been playing many ultra-historical games with thousands of carefully painted figures on dioramic terrain lately. Anyway, Ron and I have now played two Grant/Asquith scenarios with 25mm SYW miniatures and a modified version of C&C. 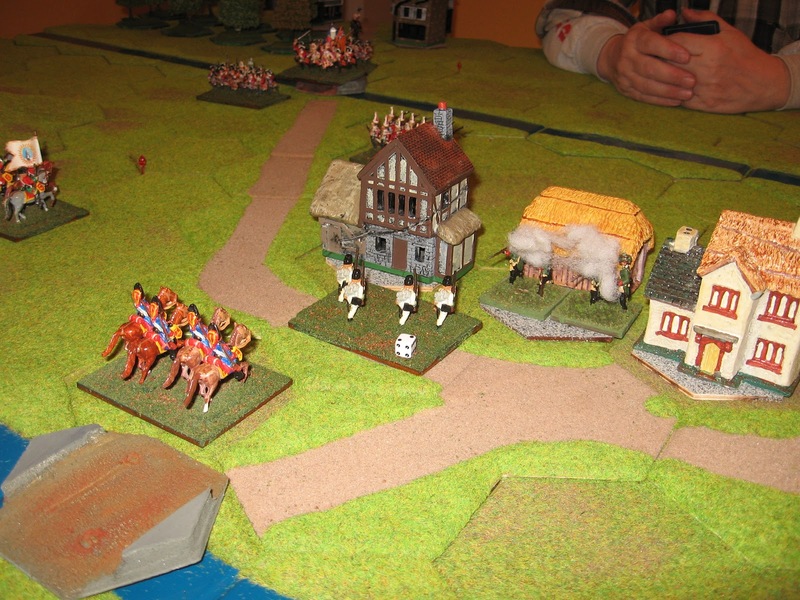 Taking the Initiative 1, scenario 20 from "The Red Book"
Last week I took command of the British and their allies to stop the Austrians from seizing a series of river crossings, or rather not stop them. After being consistently down, I struggled back to parity, next player to lose a unit would lose the game. With two infantry units, each with a general attached, entrenched in the town, with a fistful of cards giving me combat bonuses, I just had to withstand an attack by one unit of Grenadiers. I had taken 1 hit on the unit under attack but the defensive benefit of the town meant that he only had 3 dice so all 3 would have to hit. Inevitable I suppose. At least my Highlanders survived the game. The British and assorted imaginary Free Corps pour onto the field. The British force is a somewhat polyglot one. The core are four battalions of Old Glory infantry that I abandoned when I got out of 25mm SYW a dozeen years ago. They are supported now by my refurbished 30mm figures but since these tower over Ron's Minifig Austrians, I prefer to rely as much as possible on the smaller guys. This game called for a number of light units and these were supplied by various Napoleonic figures, Warrior, Hat & Minifig recruited into imaginary irregular units. The scenario was the next one from the Red Book, Initiative 2 or Scenario 21. This is a small one and we actually played the scenario twice, once using 2 units per scenario unit then once again with only 1 unit per unit. In the first game, the cards made it easy and the dice backed them up. It looked like it was in the bag when we broke for lunch but Ron's no quitter and he fought his way back into the game and made me sweat for my victory. The 2nd game was fast and furious without the depth of the first but still fun and neck and neck down to the last roll. Too fast and furious for photos. The Austrians, Minifigs all, advance rapidly. Sharp eyed viewers may notice the red and blue markers poked in between some of the hexes. These mark the C&C zones. Since this scenario calls for the opposing armies to enter on adjacent sides of the table. Ron marked out Blue & Red's zones at right angle to each other. Took a little bit of fudging but it worked. For those who are curious, the adaptations were partly a matter of picking unit types but we did make a few changes. Since we play on a table with roughly twice the number of hexes, we have introduced a march move allowing infantry to move 2 hexes without battling. If they do so they are at a disadvantage if attacked by cavalry. To add some SYW flavour we dropped the squares and instead cavalry attacking infantry not on the march only hit on infantry symbols to represent the disciplined hedge of bayonets and fire. We also made the drastic move of not reducing firepower with losses as this seemed to favour the offense too much for the SYW. We have discussed other changes but the less we change, the better therefore, so far, that's been enough. Gratuitous shot thrown in because it is the only one of the new light unit with buff small clothes. Minutes earlier there was a unit of Grenadiers in the small farm. 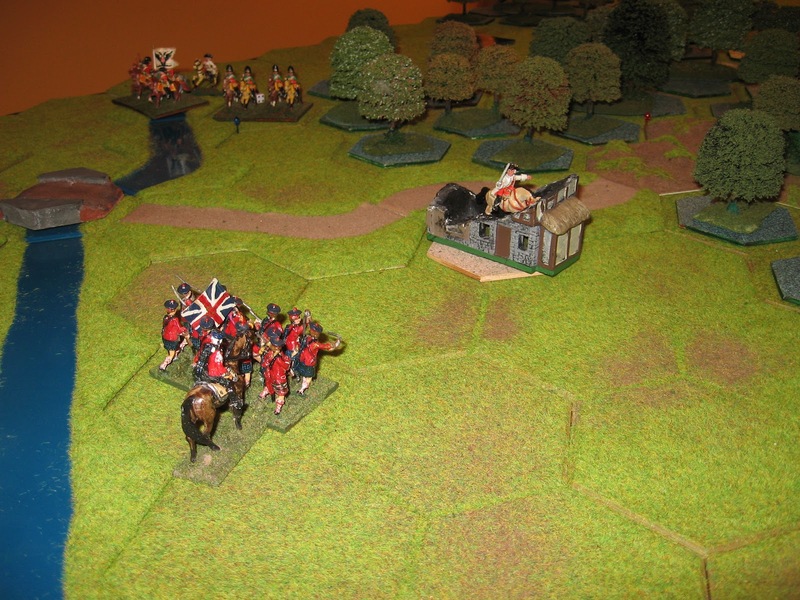 Then the Highlanders fired with a bonus and deadly effect. Instant Kharma in a Kilt.